Thank god for mediocrity. Last week’s DVD releases were gruelling in their sheer awfulness, but this week we’ve got the sweet release of 'Stolen' (2012), 'Trance' (2013) and 'Good Vibrations' (2012). That’s one failed blockbuster, one slightly underperforming thriller and one surprising and passionate love letter. In a summer where the bottom seems to have fallen out of the Hollywood blockbuster, it seems fitting that the quality of this week’s DVD releases is inversely proportional to their production budget. 'Stolen' (★★) reunites 'Con Air' director Simon West with Nicholas Cage, but unfortunately presents nothing more than a straightforward Cage vehicle, presuming little and expecting less. He plays America's greatest bank robber, pursued by the FBI's Danny Huston, who ends up in prison after an altercation with one of his crew, played with a complete absence of subtlety by Josh Lucas, jeopardises an escape. On his release his daughter is kidnapped (or... Stolen!) by Lucas, and Cage must abandon his reformed life to get her back. 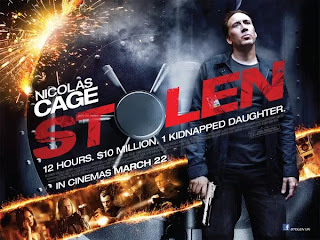 It's structured loosely as a chase film, with the FBI on the tail of Cage who's himself after Lucas, but 'Stolen' doesn’t have the ingenuity or pathos of classic chase films like 'The Fugitive'. It's difficult to care about Cage and his daughter when the film itself takes so little care in establishing them as actual people. 'Stolen' draws from '70s cop shows in its musical choices and visual language, but unfortunately it's also taken a '70s style of stilted dialogue and convenient plotting. A villain who insists on explaining himself at every opportunity recalls the laziest of vintage action films. Even the setting of New Orleans during Mardi Gras is tired and poorly exploited, having been used to much more organic effect in films like 'Double Jeopardy'. In all, 'Stolen' steals its material from everywhere and adds nothing but an off-the-peg Nicholas Cage performance. West appears to have made a habit of this. Even his directorial effort in 'The Expendables 2' was a poor riff on the first 'Expendables', which was itself posing as a self-aware pastiche of ‘80s and ‘90s action. Whilst I can't say that 'Stolen' is particularly bad, it certainly doesn't distinguish itself from the field in any positive way. 'Trance' (★★½), the new thriller from Danny Boyle, is as expansive as 'Stolen' is narrow. James McAvoy stars as an auctioneer who assists in the theft of a Goya painting, then betrays Vincent Cassel's criminal gang and keeps it for himself. After McAvoy loses his memory, Cassel employs a hypnotist to recover the location of their loot. It's a film that's difficult to talk about without giving anything away, and as with all films that rely on twists for their effect, even letting on that there are twists changes the way that you'll view it. So... um, sorry about that. But the success of the film depends on the success of the twists, and in that regard I don't find that 'Trance' hits the mark. The reveals don't recontextualise the preceding elements of the plot in a way that I found to be emotionally engaging, despite the often triumphant music accompanying them. They are more an exercise in narrative technique, and as much as I love that, it's not enough - a film should have more. As Bruce Lee teaches in 'Enter The Dragon', art must always have emotional content, technique by itself is meaningless. It's certainly lavish, and the incredible colours alone show that cinematographer Anthony Mantle is keen to apply his talents to something but isn't being given the raw material to represent, so his grading becomes almost overbearing - just like the angles Boyle's constantly trying to find. Again, outside of the lens flare during hypnotic trance sequences, the visual style itself doesn't have narrative extension - it's technique without meaning. 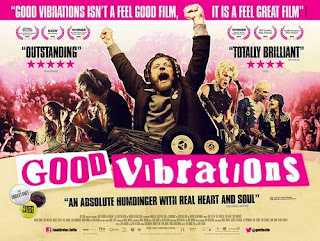 By contrast, 'Good Vibrations' (★★★★) is brilliantly inventive and expressive in its visual style. The second film from directing duo Lisa Barros D'sa and Glenn Leyburn, it depicts the role of record shop owner Terri Hooley in promoting punk music in '70s and '80s Belfast during the unfolding of the Troubles. Hooley's obsession with music leaves little in his life for anything else, and portrayed by Richard Dormer this takes the form of love and naivety rather than a cynical dismissal of political tensions. With help from his wife he opens a record shop in Great Victoria Street in Belfast, an epicentre of violence between Catholic republican and Protestant loyalist paramilitary groups. Seeing the emergence of a talented and unrepresented punk scene in Ireland, he expands to form a record label for these marginalised musicians. Shot in a hyperreal style, 'Good Vibrations' is remarkably liquid, combining vibrant shots with period footage. And although it's flashy, the period and pop songs synced wonderfully to the flamboyant visuals express both the excitement and the dire threats that Belfast endures. It's style with meaning, it's heartfelt and it’s significant. Ultimately there's a tragedy to Hooley's naivety - his love of music and disdain for tainting that love with ideas of profitability almost ruins his family, and it's the naivety of the film itself to advocate an artist chasing ruin, as if poverty is the only evidence of a pure heart. But it's a position that’s difficult not to empathise with, and can't be dismissed without a feeling of loss. Simon West has never brought anything to the table that wasn’t reheated leftovers, and not since 'When A Stranger Calls' has it been palatable, although that was entirely due to Camilla Belle’s performance rather than West’s filmmaking. 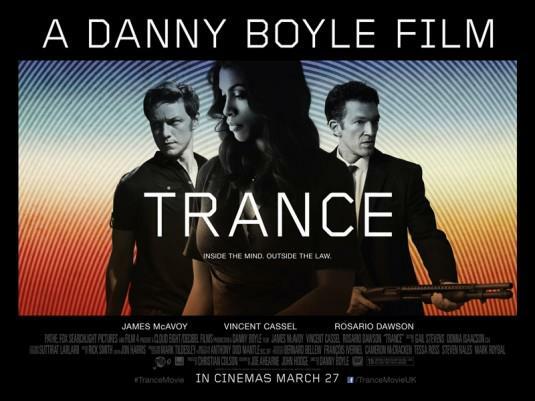 Danny Boyle shows himself again to be a capable filmmaker, though 'Trance' is notably more style than substance. But 'Good Vibrations' saves the week by being a delight, a passionate film with the power to shake the most ossified cynicism. Read more DVD Digests here.